Living in New York City, you become accustomed to ordering delivery for dinner. Some would say overly accustomed. I’m too tired/busy/sick/late/sad/angry/excited/lazy to cook tonight. Plus, it’s rainy. And my middle toe hurts. What do you want, babe? Pizza, sushi, Mexican, Chinese, Indian, Thai, Vietnamese, burgers, deli sandwiches, Korean, Mediterranean? I think I actually want barbecue. Remember the place with the great pulled pork? Frankly, it is just too easy and there are too many options. There are multiple websites where you simply choose a type of food, pick a restaurant, click the mouse to place your order and then press Pay with Credit Card. Done. They even show you with visuals exactly where your food is and when it will arrive. Louis C.K. would have a field day if he ever heard anyone complaining about any aspect of this process. We are spoiled. Sometimes, when a certain food item becomes too alluring and I just want to attempt to put it on auto-delivery for a week straight, I force myself to try cooking it instead. In this context ‘sometimes’ means ‘twice.’ The first time I tried it was to appease my husband’s craving for scallion pancakes since he doesn’t like anything else from Chinese take-out, which always makes it tricky. While definitely a different consistency and a more healthy version, these were gone within minutes. 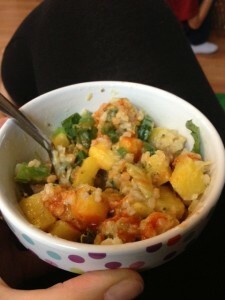 My second attempt is for a dish that I find myself craving constantly: pineapple fried rice. (Had you any clue after reading the post title?!) Our local sushi delivery spot has this and I had never tried it until a few months ago. It is addictively good. 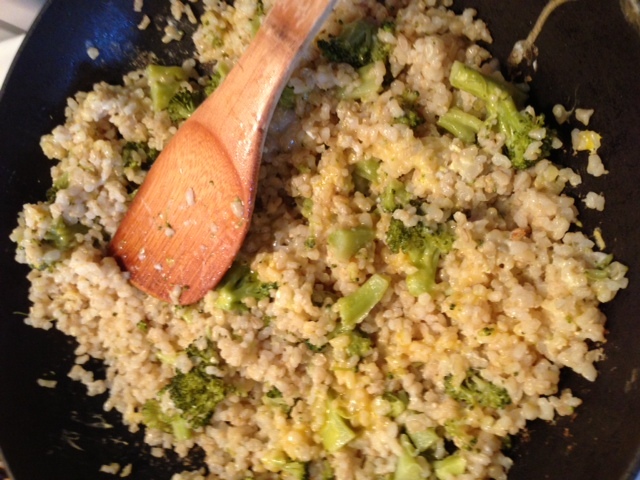 Lightly fried rice, pineapple, broccoli, and cilantro. I usually put more cilantro and add some mint if we have either at home. Today I decided ordering delivery for the ahem-th time this week was unacceptable, no matter how crappy and emotionally draining this week has been. 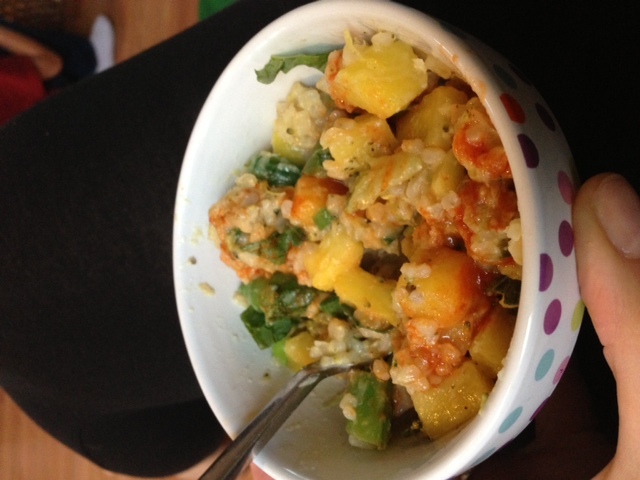 My plan was to use brown rice, add more broccoli and more pineapple than they usually do, and top it with cilantro and mint. Unfortunately, city supermarkets can be…lacking. They had no cilantro and no mint. Although the manager did tell me how much organic mint he has growing in his garden in Queens. Thanks. I decided to try fresh basil instead and some bright green sugar snap peas grabbed my eye so I threw those in the basket too. I worked today, but was able to make the rice with broccoli early in the day and then simply add the other ingredients and stir fry everything at night for about five minutes. Even though I learned that I unequivocally stink at making rice, the flavor profile (shout out, San Fran!) of the dish still came out pretty undeniably fantastic. Plus, this dish is gluten and dairy-free. Vegan, too, if you leave out the eggs. Most delivery food can’t claim all of that and include this many servings of fruits and vegetables, my friends. Here’s to hoping this can be a small bright spot in your week the way it was for us tonight. In a big frying pan or wok, add a bit of your favorite oil and turn the heat to med-hi. I used a combination of coconut and sesame oils. Once the oil is hot, add the rice/broccoli mixture and then, while pushing it around rapidly, crack both eggs into the pan. The egg should cook quickly throughout the rice, at which point you can add the pineapple, scallions and sugar snap peas. Stir fry for about another 3-5 minutes and top with finely shredded basil. We love to eat ours doused sprinkled with Sriracha (us) or KimKim sauce (the boys). 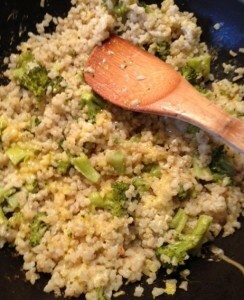 My mushy rice/broccoli combo, ready for the eggs to drop in and say hello. Speaking of dropping in and saying hello…if you make this dish with perfectly cooked rice, can you please ask me over, feed me and teach me how to properly cook rice? Thanks. 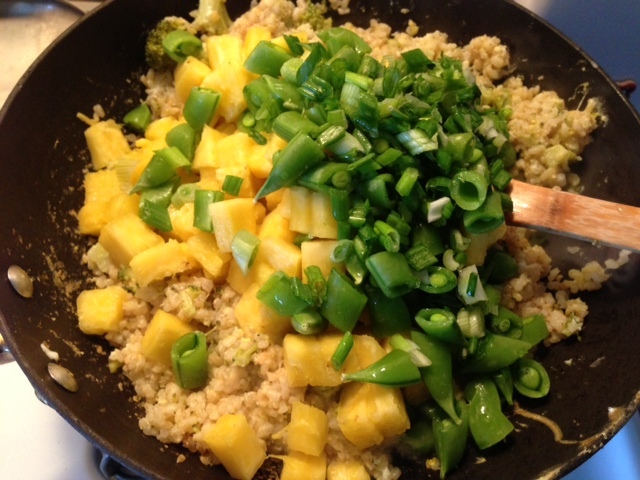 I felt all cooking show-y as I poured in my pre-diced pineapple, sugar snap peas and scallions. Unfortunately, there was no camera crew here to catch it. I stopped myself after two bowls, but only because I had already sent my husband a photo of what awaited him for dinner. Explaining the empty pan when he came home starving and pumped up for pineapple* would have been awkward. *Saying that my husband is ‘pumped up for pineapple’ is also awkward. And probably one of the many reasons he prefers to be anonymous on here. This entry was posted in What's for Supper Wednesdays and tagged asian, basil, broccoli, Brooklyn, brown rice, coconut oil, cooking, cruciferous, dairy-free, delivery, dinner, fried, gluten-free, goiterous, healthy, New York City, pineapple, pineapple fried rice, recipe, rice, scallions, sugar snap peas, take-out, thyroid, vegan, vegetables. Bookmark the permalink. Follow any comments here with the RSS feed for this post. Post a comment or leave a trackback: Trackback URL. Thank you for ‘fessing up to ordering in. Whenever I see your foodie posts, I try to imagine where you find the time and energy, and then I pick up the phone for delivery for the nth time during the week. It’s nice to know that you are sucked into the easy of the delivery like we are. Invest in a rice cooker. They are not terribly expensive and do one thing REALLY well…they make perfect rice every time and all you have to do is add water and rice and plug it in. Millions of Asians can’t be wrong. I LOVE MY RICE COOKER. Best appliance, ever. I also always make extra rice so there is some available for fried rice the next day. It also makes awesome brown rice, and I have done mixed grain in it like quinoa and wild rice. Does not however, make oatmeal, trust me on that. Let me know if you try it, please! I just last night cooked rice perfectly! And it was totally the rice. Not me. It was a non-minute-rice kind of rice. I’ll check the brand. My MIL picked it up when they were visiting and I now think it is what I must get always. ALso? I just had pineapple fried rice for dinner out the other night and ate the leftovers the other day. I’m more afraid of pineapples than rice. Do you buy a whole one or already cut up? Yes, please let me know when you remember the brand! Someday I’ll use this Perfect Rice and finally have a rice cooker and nobody will be able to stop me! BWAHAHAHAH. Oh, and yes, of course you may pin it to Pinterest! Can you please make sure it links back to this blog, though? Thank you!